1. Keep dramas very short and simple, from a few seconds to a minute or two, and avoid elaborate props. Let participants simply glance at their lines and speak in their own words. 2. Let anyone who wants to take part do so; avoid making people be passive hearers only. Let tots too small to act out a part shout, cheer or boo at appropriate times. Their leader might say, “Let’s celebrate this” and the tots join hands and dance around in a circle. 3. Let adults and children act out stories together during worship or cell meetings. Thus, children know they are an important part of a church body. Having one or more men take part imparts seriousness in a child’s mind. 4. Actors are not to show off, and you need no audience. In small groups, let everyone relive the sacred event if they want to join in. The acting is not to entertain but to relive sacred events. If people find it entertaining, that is nice but not essential. 5. Avoid pushing shy people into acting parts, or visitors, unless they are eager to participate. 6. Let older children lead, disciple, and prepare younger ones to take part. 7. For most stories, actors need not memorize lines, just the idea, and ad lib when the narrator comes to their part. In small groups, skip formality, it is all right to read lines. 8. Link God’s truths to their historical origins. A truth’s impact is much greater when a group acts it out, reliving the historical events that God used to reveal, fulfill and apply it. Note: Other religions base their doctrines on ethical, metaphysical and philosophical musings of mystics, but God has revealed all His key truths through concrete historical events and stories. Inspired prophets drew valid theological conclusions from those events, from which we get true theology. The founders of non- or quasi-Christian religions all began with a philosophical system. Mohammed, Confucius, Buddha, Hindu holy men and Joseph Smith of the Mormons conceived their religion in their minds by private meditation. However, not one vital Christian truth sprouted purely from some mystic’s imagination; key scriptural doctrines all grew out of historical occasions, and the Holy Spirit powerfully uses recounting them to bring men to repent, transform them and provide models for ministries. 10. Prepare beforehand to act out stories in a way that requires little or no rehearsing. Narrate key parts of a story and pause to let children and adults act out actions or speak dialogue. Modify the scripts in it to fit your local circumstances, and add parts for more actors. 12. Always include the littlest children in some way. Use your imagination. They might be observers who shout “Hurrah” when you say to shout for joy, or “boo” when told to show disgust. 13. Write your own story scripts. Read over them until you can tell key parts by memory, and look for a few things helpers can say or do when you come to their parts. If you are not so creative, then ask others to help whose God-given child’s imagination has not been educated out of them. Caution: If doing this for the first time, do not make it long and complex. 14. Let everyone participate in some way. At least give them a cue to shout “Amen!” or some other brief phrase. If relating the account of Pentecost, let everyone howl like the “mighty rushing wind” that the crowd heard. 15. Be careful about portraying deity. Some people feel uncomfortable seeing an actor being God. Instead, let a reader stand to one side and simply do the Voice of God. 16. In small groups, put chairs in a circle or horseshoe for stronger interaction. Avoid people seeing only the backs of others’ heads except for one speaker. 17. Accept children’s inevitable, noisy confusion. It’s normal. Scripture requires everyone to participate in some way in worship (I Cor. 14:24; Col. 3:16). 19. Flesh out any abstractions taken from Romans and other doctrinal books. Paul assumed his readers knew the stories of Adam, Abraham, Jacob, Esau, and David; so, to teach Paul’s points, tell the stories that underlie them; paint background to enliven otherwise abstract rhetoric. 20. Ask discussion questions that help others talk and fix the truths in their minds. 23. Deal with stories as Jesus and His apostles did, by linking Old Testament events and laws to their fulfillment by Jesus, and to believers’ duties in Acts and the letters that you practice with the Holy Spirit’s power. This brings balance to a cohesive church body. 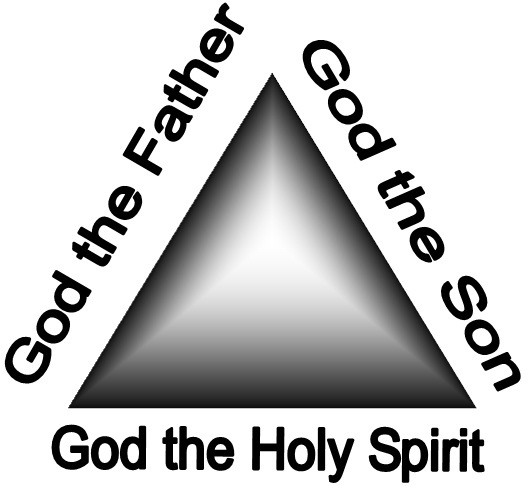 Note: Baptism in the Name of the Father and of the Son and of the Holy Spirit affirms a believers’ tie to each of the three divine Persons. Thus, just as the three Persons deal with every divine truth in perfect harmony, you, too, should harmonize a vital truth’s three dimensions. Deal with a doctrine fully only when you can span the space between heaven and human hearts, starting with 1) truth’s origin in heaven with the Father, 2) its perfect fulfillment on earth by the Son, and 3) our living it out it in the Sprit’ power. The diagram below illustrates this integrated historical and Trinitarian approach to truth, showing how to use stories to keep balance in teaching. Events and laws of the Old Testament revealed God’s attributes and eternal decrees. In the Gospels, Jesus the Living Word of God fulfilled the Father’s decrees, and lived out God’s eternal attributes in His human flesh within time and space. Acts, the letters and Revelation show the Spirit empowering believers who apply God’s truths in practical service.